I AM MORE THAN PLEASED TO SHARE WITH OUR JOY , IN OUR MASTER'S ACHIEVEMENTS ARE STARTED NOTICED BY GOVERNMENTS . எல்லாம் இறைவன் அருள் , பெரியவர்கள் ஆசி , உங்களை போன்ற ரசிகர்களின் ஆதரவு . let us all prey that many more deserving to come his way . Posted: Thu Sep 26, 2013 1:16 pm Post subject: Resp. 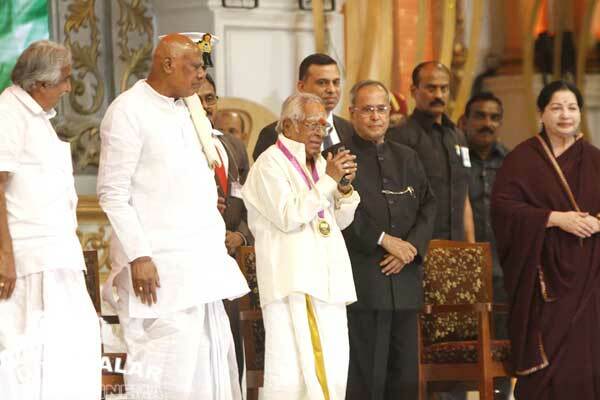 Though I had lost interest in all these awards, it is very pleasing to see MSV being honoured by the President himself, the very first time. Something tells me that this is the Ice Breaker nature was waiting for. Let this start a deluge of the highest awards for MSV. Thanks for sharing the excellent photos featuring our MM. Memorable indeed!